Battens are one of those things that professional boat builders take for granted, I think. They've seen them since their first apprentice days, know what they look like, their different sizes, which batten is right for which curve, and on and on. Not so for we poor amateurs trying to learn boat building out of books. I must admit they are still a bit of a mystery to me. Such a simple tool. So important. So easy to break! What is a batten? It's just a long piece of clear grained wood -- i.e. no knot holes that create a weak spot. You use it in lofting to recreate the long curves of the sheer line or buttock lines on your lofting board by bending it around a few strategically placed nails. 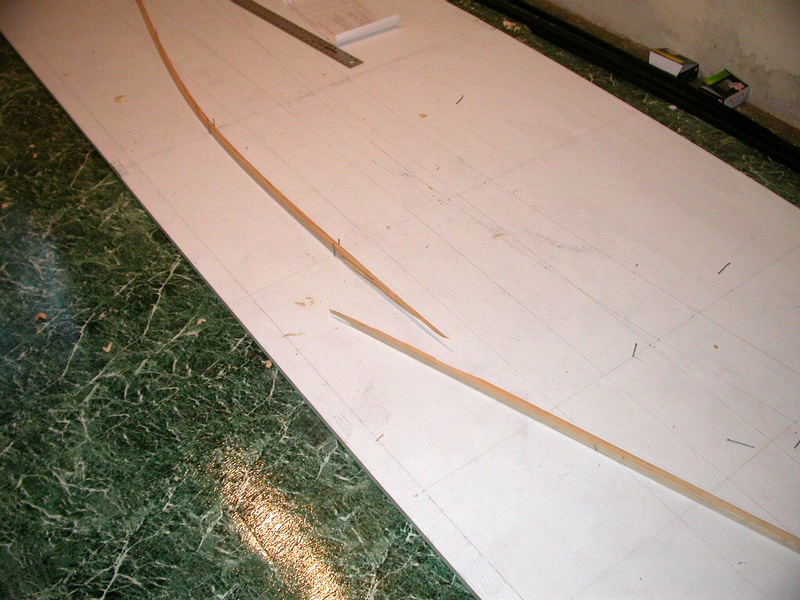 I got away with some really crude battens when building Cabin Boy because Cabin Boy didn't have any difficult curves. Vintage does. Lots of them. In fact, you could say that Vintage is nothing more than a set of curves with wood wrapped around them. Vintage - a set of curves with wood wrapped around them. I knew battens would be important for this build, so I wanted to make a few really good ones. The problem is, what size? The boat building books are irritatingly vague and contradictory on this subject. Robert M. Steward in "Small Boat Construction" says it best: "Like a lot of boat building operations, accumulated experience will aid materially in the selection of batten sizes." Experience gained, presumably, by breaking lots and lots of battens. The battens themselves aren't much help. As far as I've been able to tell so far, they don't give any warning. No creaking or complaining as you bend them around a too-tight curve. Just a sudden crack! and they give up the ghost. One thing the boat builders do agree on is that battens should be the stiffest, largest batten that you can bend around the curve. As Steward says "Start with the battens on the heavy side until you get the hang of it, ripping the strips narrower as needed." So, I started by buying a 12' length of clear white pine, one of the woods recommended for battens. I ripped two fairly heavy battens from it, using my brand new Skilsaw. Yes, I finally broke down and bought one specifically to make ripping these battens a fairly easy job. I bought the model recommended by Tom Hill, the Model 77, because -- unlike every other circular saw -- it has the blade on the left side of the saw. This allows you to see where you are cutting without leaning over the saw. It's also very easy to adjust. I also took the advice to paint my new battens black, to make it easier to see the curve against the white background. 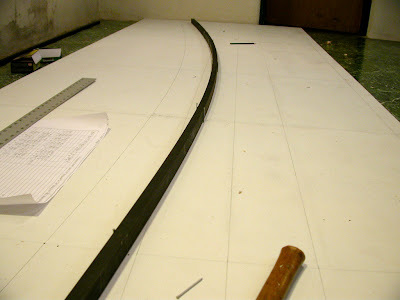 My largest batten -- 1 1/2" x 3/4" -- had no problems curving around Vintage's sheer line. It was quite stiff, but didn't break. The problem came with the much more drastic buttock lines. What's a buttock line? Sorry, couldn't resist the obvious joke. No, no. They are the two lines that swoop upwards from the bottom of the boat to the sheer line. Well, after two battens gave up the ghost for the cause of accumulated experience, I gave up and went to bed. Will try again today with 1/4" battens. Oh, and I'm not sure that black paint was a such good idea... it tends to rub off on the lofting board as you try to wrestle the batten into position. I certainly won't bother painting a batten black until it proves itself up to the job! John, You and your commenters are a gold mine. Keep em comin'. I use 1/4" mahogany (luan) doorskin plywood to make my battens. A 4x8 sheet is less than $15, and for another $5 the lumber yard will rip it into 2" strips for me. 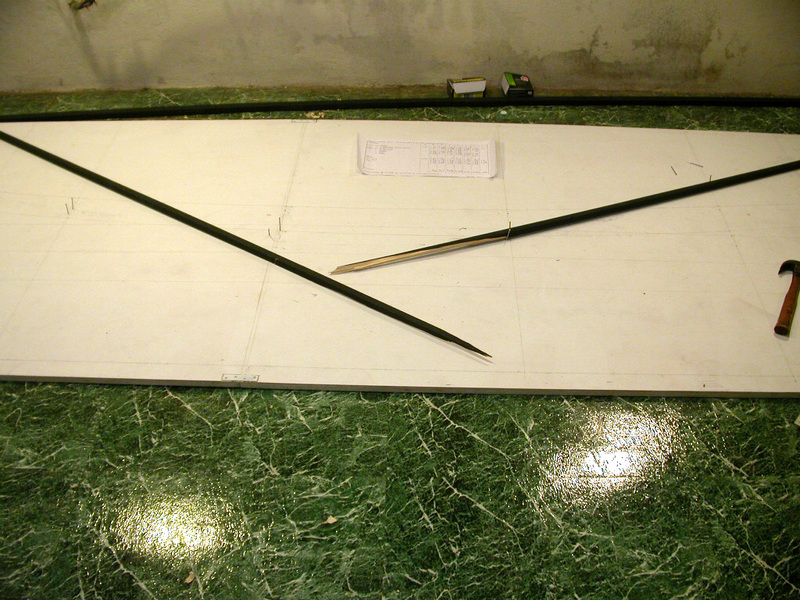 For $20 I go home with 24 battens, or raw stock for laminating projects like davits, tillers, fiddles, etc. For increased durability, slap a quick coat of epoxy on both sides of the batten. We gotta talk about power tools- you're on a deadline, and you've got a lot of cutting and sanding and fitting ahead of you- NOW is the time to invest in the stuff that costs you money but saves you time. If you paid yourself $20/hr, the time you spent messing around with your jigsaw would have already paid for a decent circular saw. And you are gonna NEED a circ saw. oops, edit- I posted before I was finished. 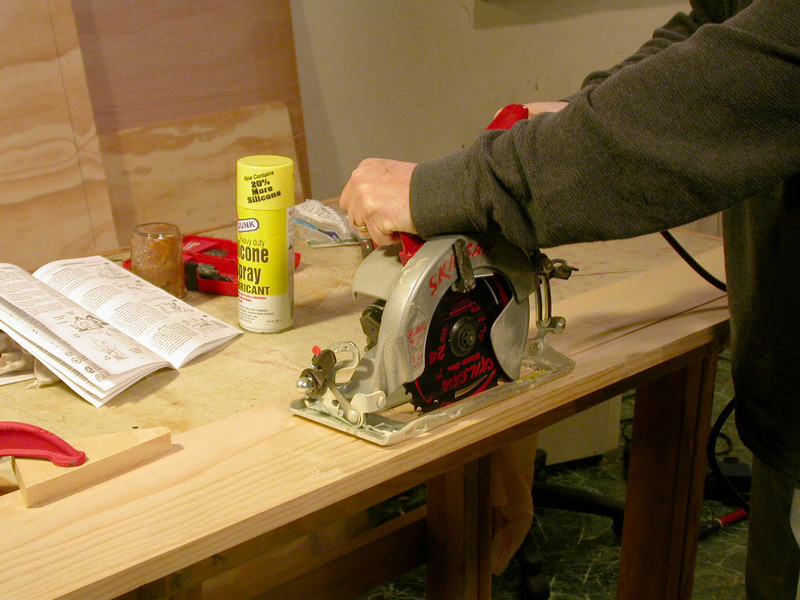 Now that you have seen the need for a circ saw, now is the time to look at buying a multi-tool, a good sander, a planer. For a couple of hundred dollars you will have the tools that will save you dozens of hours on this project as well as future projects, while also giving you a better finish. I was thinking about a router for trimming patterns, planks, etc. I have a reasonably good sander. What's a multi-tool? I could also use another power drill... I just spent the afternoon swapping drill bits, while building a saw horse. The Skilsaw is amazing. Should have bought one a year ago. 3/8 by 3/8 cedar battens work very well for me. They were easily obtained from planking stock on one of my boats and have not yet failed me. That's also the size we used at the Wooden Boat school a few years ago. For boats less than 20 feet, I can't imagine needing anything heavier. Bob: I finally licked my buttock lofting problem. I don't want to give anything away, but it took *two* battens. Experienced boat builders will know what I mean. Are you done? I sure hope not. Your writings have been interesting and greatly entertaining so far.